The Azure Redis Cache team is very excited to announce the general availability of Azure Redis Cache Premium tier. This offering is an Enterprise-ready tier designed for maximum scale and integration. The Premium tier was announced this past October. Since then, the team has been working hard to improve reliability to make this offering production-ready so you can start building and deploying applications. Following are the highlights in the premium tier: Starting today you can create Premium tier Caches with all these features working together. This was a limitation in the public preview where you could not create a Redis Cache with clustering and persistence enabled. Caches in Premium tier are deployed on hardware with faster processors and better performance as compared to the Basic/ Standard Tier. Throughput for the same sized Cache is higher in Premium tier as compared to Standard tier. For example, a 53 GB Cache, throughput of P4 (Premium) is 250K RPS as compared to 150K for Standard C6. Please refer to these FAQ for more information on the performance characteristics of Premium tier. Premium tier allows you to persist data stored in Redis to an Azure Storage account. In the Basic/ Standard tier all data is stored in memory only. In the case of underlying infrastructure issues, there can be potential data loss. We recommend using the Redis data persistence feature in Premium tier to increase resiliency against data loss. Azure Redis Cache offers Redis persistence as implemented in Redis. We are offering RDB persistence now and AOF will be enabled later. See this article on how to create Redis Cache and enable Redis Persistence. Azure Redis Cache offers Redis cluster as implemented in Redis. With Redis cluster, you get the following benefits. The ability to automatically split your dataset among multiple Redis nodes. More throughput: Increases linearly as you increase the number of shards. More memory size: Increases linearly as you increase the number of shards. You can create Redis Cluster which can store more than 53 GB of data. Azure Redis offers Redis cluster in a master-slave model where each shard (Redis node) in the cluster is a master-slave pair and the Azure Redis Cache service manages replication and failover between nodes in the cluster. Redis clustering gives you maximum scale and throughout. Throughput increases linearly as you increase the number of shards (nodes) in the cluster. For example, if you create a P4 cluster of 10 shards, then the available throughput can be as high as 250K *10 = 2.5Million RPS. Please refer to our FAQ for more information on the performance characteristics of Premium tier. See this article on how to create Redis Cache and enable Redis cluster. Caches created in the Standard tier are accessible from the public internet. Access to the Cache is restricted based on the access key. In Premium tier, you can further ensure that only clients within a specified network can access the Redis Cache instance. You can deploy Redis Cache in an Azure Virtual Network (VNet). You can also use all the features of VNET such as subnets, access control policies, and other features to further restrict network access to Redis. See this article on how to create Redis Cache in an Azure Virtual Network. As part of a special promotion, you’ll continue to receive Standard-tier pricing using Standard-tier meters in December 2015. GA prices take effect on January 1, 2016. 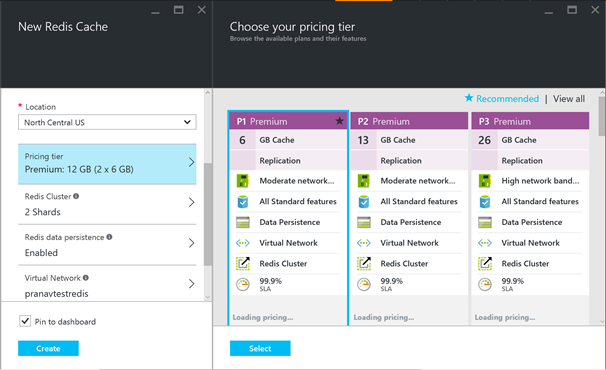 Please see the Azure Redis Cache pricing page for more details. Azure Redis Cache guarantees that a Standard/Premium cache will be available at least 99.9% of the time. To learn more about our SLA, please visit the SLA page. SLA only covers connectivity to the Cache endpoints. The SLA does not cover protection from data loss. We recommend using Redis data persistence feature in the Premium tier to increase resiliency against data loss. You can create Redis Caches in Premium tier using the Azure Preview portal or automate using ARM templates and Command–line tools. For more details, please check out the Redis Cache documentation. If you have any questions or suggestions for new features as you try out this offering, please reach out on the Azure Redis Cache Forum or Azure Redis Cache User voice.